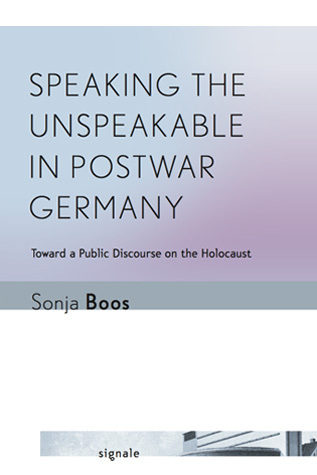 Speaking the Unspeakable in Postwar Germany is an interdisciplinary study of a diverse set of public speeches given by major literary and cultural figures in the 1950s and 1960s. Through close readings of canonical speeches by Hannah Arendt, Theodor W. Adorno, Ingeborg Bachmann, Martin Buber, Paul Celan, Uwe Johnson, Peter Szondi, and Peter Weiss, Sonja Boos demonstrates that these speakers both facilitated and subverted the construction of a public discourse about the Holocaust in postwar West Germany. The author's analysis of original audio recordings of the speech events (several of which will be available on a companion website) improves our understanding of the spoken, performative dimension of public speeches. While emphasizing the social constructedness of discourse, experience, and identity, Boos does not neglect the pragmatic conditions of aesthetic and intellectual production—most notably, the felt need to respond to the breach in tradition caused by the Holocaust. The book thereby illuminates the process by which a set of writers and intellectuals, instead of trying to mend what they perceived as a radical break in historical continuity or corroborating the myth of a "new beginning," searched for ways to make this historical rupture rhetorically and semantically discernible and literally audible.